André Kertész, “On Reading” – Rethink. Perhaps the strangest thing about the human condition is how one has to distance oneself from humanity in order to understand and appreciate it. The activity of reading can be emblematic of this distancing when it does not serve as its catalyst. Kertész’s photographic essay seems to have this as its starting point. We seem to read for different reasons and we certainly do read under different circumstances. And yet, there’s some kind of convergence between those just looking at a book or relaxing, those studying or immersed, those struggling to read like their life depended on it and those who have nothing to do but read. I can’t help but think that one of the first images of his collection presents the problem symbolically. Newtown, Connecticut, October 17, 1959: a beautiful, sunny fall day. The sunlight is vigorous and our view squarely faces a window with that light, with a small table in front of us and book upon it. Next to the book, also on the table, is a small sculpture of a bird in a basket. The window has a delicate, sheer curtain covering it almost entirely. The sun combines the tree branches behind the window and the shadows and highlights which fall upon the curtain to create a thick but beautiful weave. We’re left to wonder if our gaze outside the window will only be caught by a web; a bird is inside, after all, next to the book. Do we need books to represent a beautiful but inaccessible nature? To see anything outside? That might be considered an over-the-top formulation, especially as Kertész purposely placed his camera to capture a certain design only. But then – and this is pretty much as far as I am in his book – consider his photos of schoolchildren, placed one after the other in the essay. 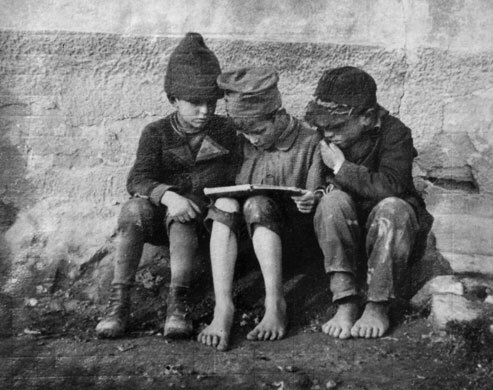 Esztergom, Hungary, 1915 – 3 poor boys, barefoot and in torn clothes are huddled over 1 book, like as if they’re trying to get everything they can out of each page. This is followed immediately by Paris, 1929 – the schoolgirls all have neat shoes and stockings and coats, and each one is wrapped up in their book. There is no need to look at their faces. Finally, beyond desperation and plenty, the proximity of boredom and wonder. New York City, April 23, 1969: the kid lounging, relaxed and immersed in his book while the other students look like they’d be anywhere else – my hero. There are other photographs in this collection. The ones of the elderly struggling to see the text while life moves on around them are particularly heartbreaking. It is tempting to say that reading encompasses too much of a diversity – it’s the only way to do justice to those alone, with nothing to do but read, and those with the luxury of using books to not talk to anyone else. Kertész’s very scope, however, does not allow us that answer. We are continually watching them read. Whether they know it or not, all of them are looking for the same thing we are. Thanks for this! It’s a lovely tribute to literacy.